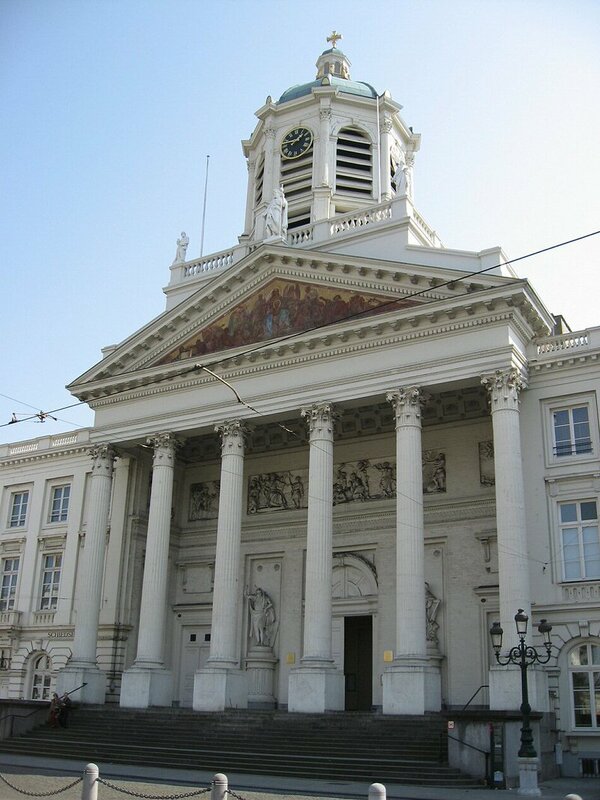 The western front of the Church St-Jacques-sur-Coudenberg (consecrated in 1787) was also designed by Barré and Simard. The building was erected by Louis-Joseph Montoyer, then Tilman-Francois Suys gave it a new attic and campanile in 1849. Originally, the church was dedicated to St James the Great. It may have escaped damage by fire in 1731 but was unable to withstand the onslaught of Charles of Lorraine and his urban planning project. It was demolished and the new church was sited in line with rue Montagne de la Cour. It was turned into a Temple of Reason during the French Revolution. The biblical statues of Moses and David were merely renamed Solon and Lycurgus but the low-relief sculpture of Le Sacrifice du Messie on the tympanum of the pedi­ment was removed. 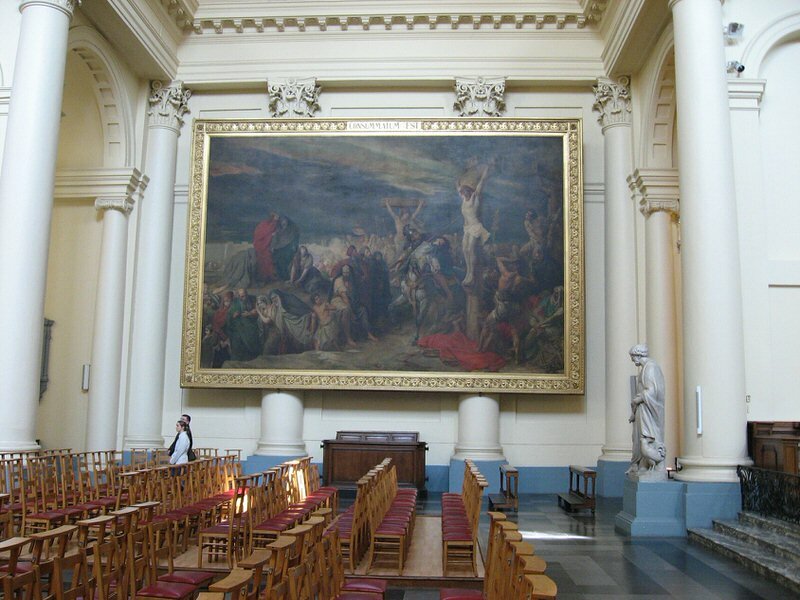 The fresco entitled La Vierge consolant les Affligés is a late work by Jean Portaels (1852); it is topped with three sculptures (St Andrew, St James and St John), carved by Egide Mélot. The interior is plain but solemn. 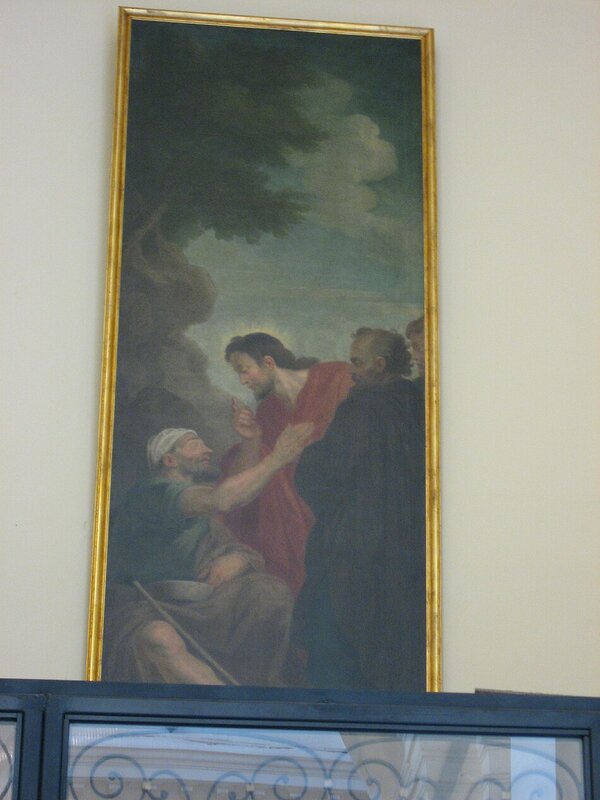 Note the Stations of the Cross by J Geefs, and two large paintings by J Portaels at each end of the transept. They represent the Crucifixion and La Croix consolatrice. 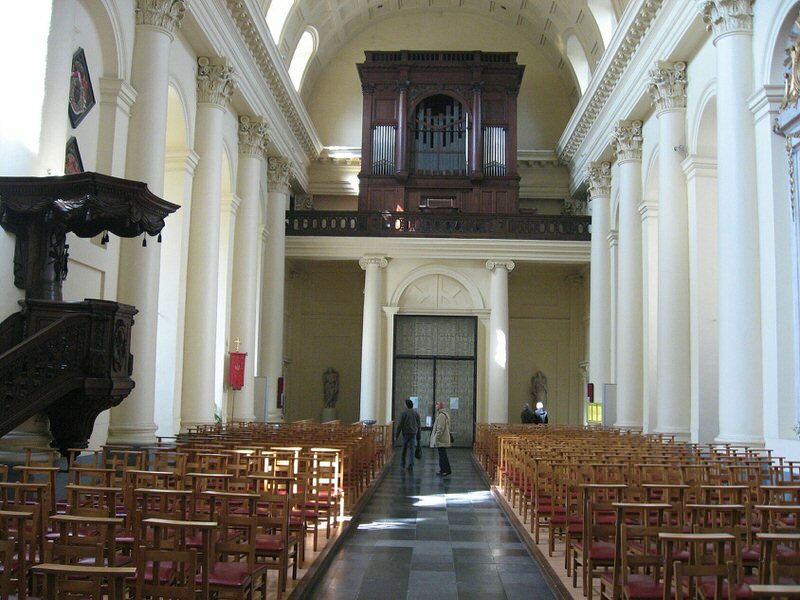 In the chancel (left) is the royal pew linked by a gallery to the palace gardens. On 21 July 1831, Prince Leopold of Saxe-Coburg-Gotha took the oath that made him the first King of the Belgians, on the steps leading up the peristyle of the church. In the centre of the square stands an equestrian statue of Godefroid de Bouillon. King of Jerusalem, made by Eugene Simonis in 1848 to replace a statue of Charles of Lorraine that had been demolished during the French Revolution. From this central position, there is a superb view of the tower on the town hall (east side) and the Palais de Justice (south side). The facade with its triangular pediment and six Corinthian columns is evocative of a Greco-Roman temple. On the pediment, a Portaels fresco: “The Virgin Mary, Comforter of the Afflicted”. In its original form, the church is said not to have included a tower. On its completion, however, it was given a flimsy wooden bell tower. This was very ugly and was replaced in 1849 by the present tower, also made of wood, which houses four bells. Three statues stand on the balustrade: in the centre Saint James (St. Jacques), on the left Saint Andrew, and on the right Saint John, all three by the sculptor Egide Melot, who died in 1885. In the peristyle: two large statues; David, to the right, is by F.J. Janssens of Brussels, while Moses, to the left, is by Olivier de Marseille, who also made the bas reliefs. 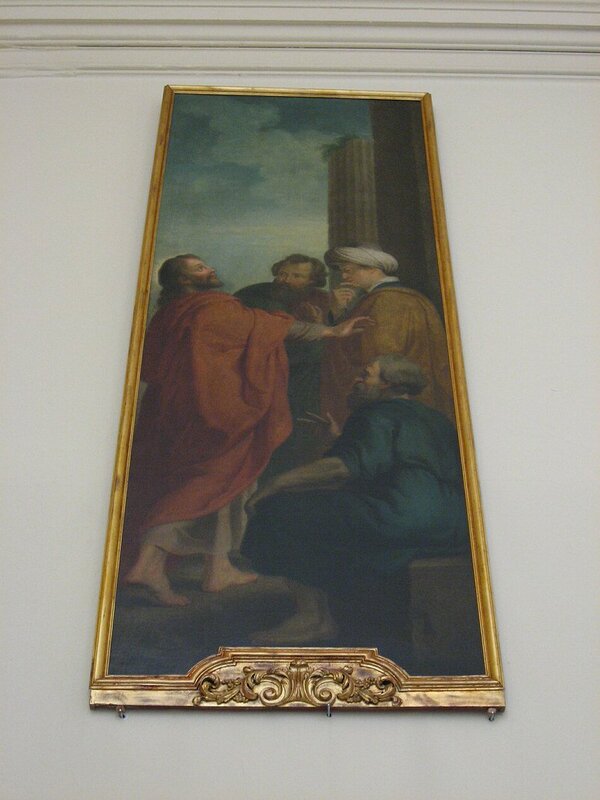 From left to right: Jesus chasing the thieves from the Temple — Saint John Nepomucene — Martyrdom of Saint James and Saint Philip — Peter healing a cripp at the door of the Temple. 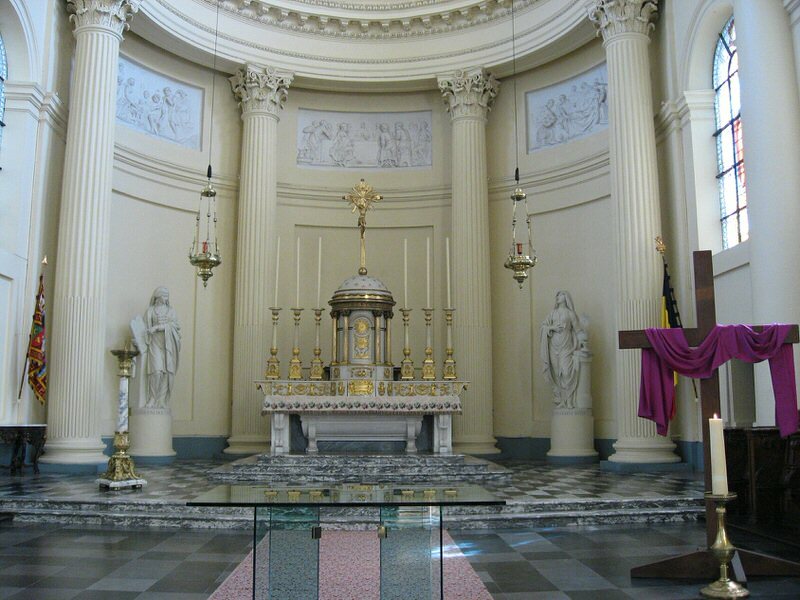 The church has a noble simplicity, the eyes being drawn to the tabernacle of the central altar. 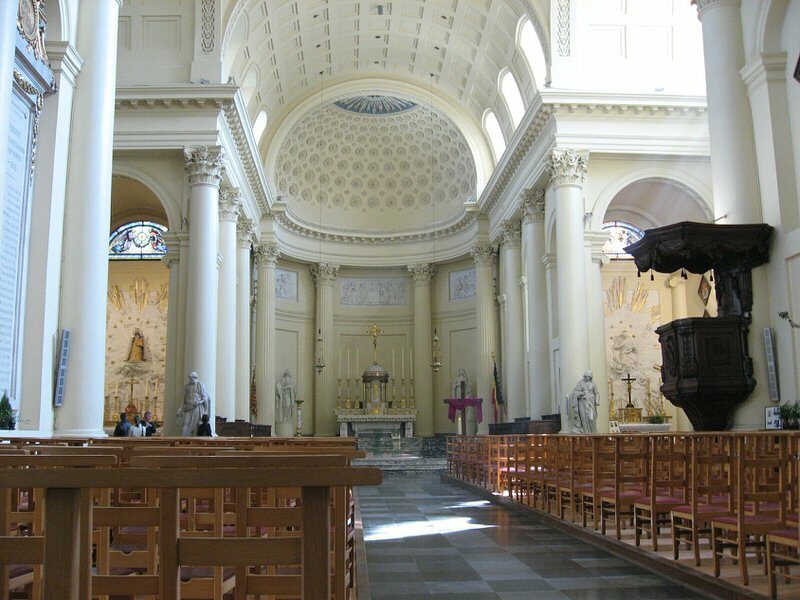 In the nave and transept: the attached Corinthian columns bear the entablature, while the apse of the chancel has four isolated columns in the purest Corinthian style with fluted and cabled shafts. 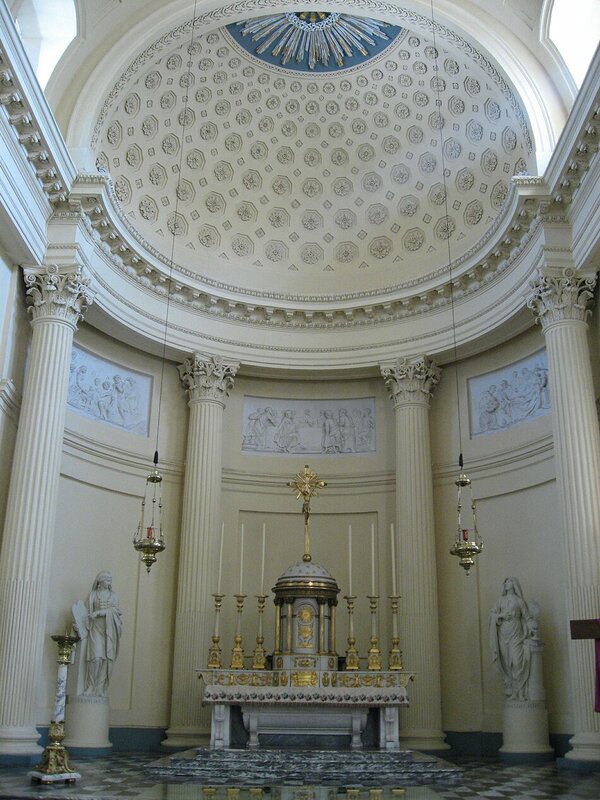 The semi-hemispherical vault of the cupola is decorated with octagonal caissons full of roses. 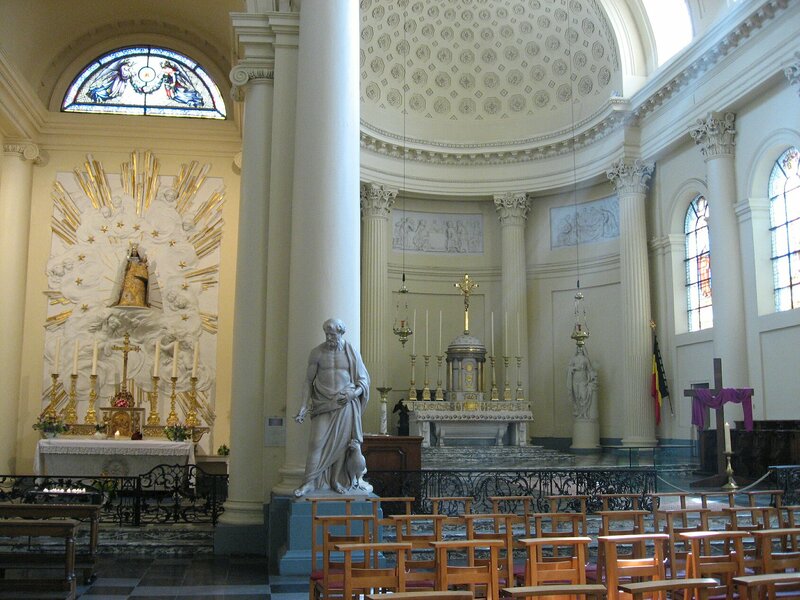 Before the chancel entrance, the two marble statues are by Anrion de Nivelles and represent Saint Peter, on the left, and Religion, on the right. In the chancel, two small paintings: to the right, Saint Luke with the Oxen Head, attributed to Ribeira (1598-1656) of the Spanish school and, to the left, the Crucifix painted by an unknown artist. To the left, the royal box.The upper bas reliefs of the apse represent the Birth of Christ, the Last Supper and the Burial. The two statutes to the left and right represent the Old and New Testament. All these works are by Godecharle. To the right of the chancel: the altar of Saint John Nepomucene, martyr of the Confession. Hanging on the wall are the necrologies of the Kings of the Belgians and of the Prince Regent. On your right, the epitaph of the draughtsman M.F. Jacobs (1776-1812), by Godecharle. 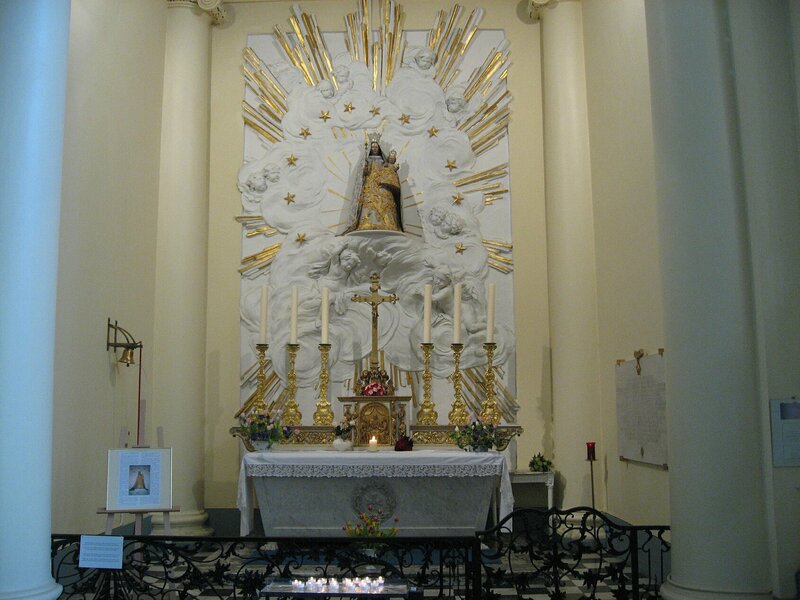 To the left of the chancel: the altar of Lady “Our Lady of Great Kindness, Refuge of the Sinners”, a statue placed in the old church in 1641. 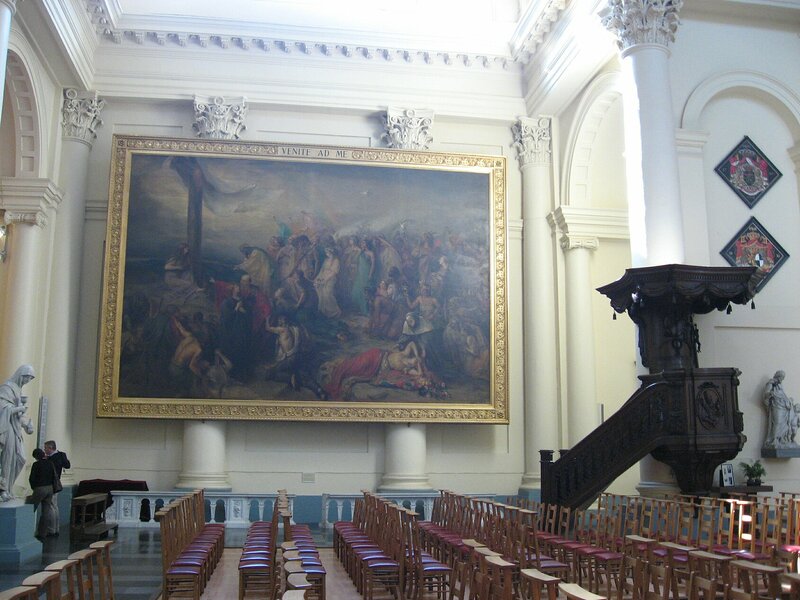 At the far ends of the transept, two large paintings by J. Portaels. to the right “Venite ad Me omnes” (The Cross of Salvation). High Altar, it was removed in 1972 to allow for the adaptation of the chancel to the liturgical reforms following from Vatican II. Polychromatic wooden statue of Saint James, by Ch. Vleminckx (1888). The Pulpit is the work of cabinet maker J. van Meeuwen (1793) and the statue of Saint Joseph with the Baby Jesus is an important work by the sculptor Delvaux (1746). The statues of the Stations of the Cross are by J. Geefs (19th century). The organ, dating from 1883-1884, is by the organ builder Pierre Schijven. Some parts of the organ chest come from an earlier organ chest by the cabinet maker Conrad van Eyck (18th century). At the back of the right nave: a painting showing the healing of the blind man (unknown 18th century artist).